With the Stadium Series weekend quickly approaching, hockey fans in Denver are preparing for something special. 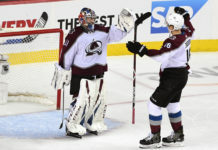 Old-timers like Patrick Roy, Ray Bourque, Peter Forsberg, Claude Lemieux and Joe Sakic are expected to suit up for the Colorado Avalanche, while Kris Draper, Martin Lapointe, Nicklas Lidstrom and Jiri Fischer will be wearing red and white representing the Detroit Red Wings. 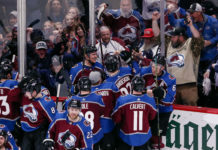 The rivalry between these two teams is long and bloody, and while fans know not to anticipate bloody punches and dirty hits (since the guys are now in their late 40s or older), the hockey is sure not to disappoint. 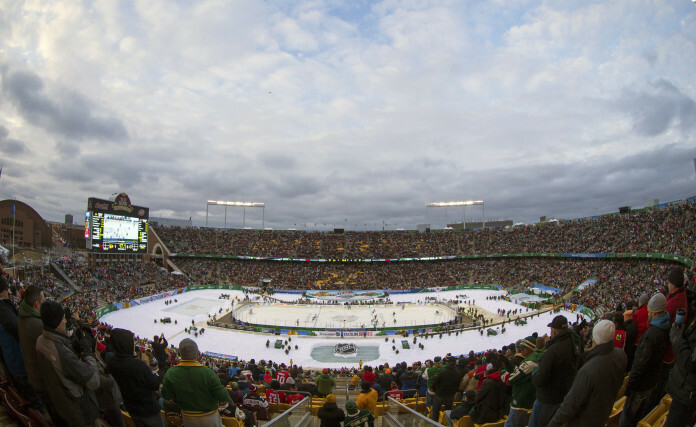 We got a little bit of an alumni taste this past weekend as the Chicago Blackhawks and Minnesota Wild participated in their own Stadium Series weekend. And for old-time hockey fans, this game offered something that the Avs and Red Wings won’t be able to offer- a team that doesn’t actually exist anymore. Last Friday night, the Chicago Blackhawks alumni donned the famous red indian-head jerseys while the Minnesota Wild players wore the old and departed North Stars jerseys. When the North Stars moved to Dallas in 1993, it was the end of an era for players like Mike Modano, Neal Broten and Dino Ciccarelli. So when those those three players skated out at TCF Bank Stadium in Minneapolis on Friday night wearing pristine white jerseys with a big green “N” in the middle, fans got a little taste of history as nostalgia filled the football stadium and they remembered what these alumni games are really about – tradition and just good-ol’-fun-hockey. The Hawks and Stars game had a little bit of everything- we got to see Denis Savard and Dino Ciccarelli “drop the gloves” just minutes into the first period. We got to see Troy Murray take a penalty shot on Gilles Meloche (they don’t serve penalties in the Alumni Games), who wore his unforgettable retro-goalie mask. And, we even got to see Minnestoa and eventual Dallas fan-favorite, Mike Modano, get stripped of the puck on a breakaway. As the game went on, the competitiveness escalated just as we hope (and suspect) the Avs and Wings game will. We’ve seen photos of Roy back in the net taking shots and Milan Hejduk has been practicing his stick handling out at Copper Mountain, but what about the other big favorites like Lemieux and Forsberg? We haven’t seen them practicing, but that doesn’t to mean they aren’t playing or aren’t excited. “Yeah, I’m going to play. I’m looking forward to it,” said Lemieux from the Manhattan Beach, Calif., office of 4sports North America, a player agency in which he serves as president. “I hear Peter [Forsberg] is coming too. That’s real good, because I’m going to need someone to feed me the puck,” Lemieux said in Mile High Sports Magazine in October (Rivalry Renewed). 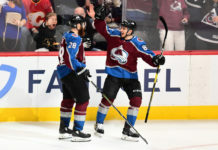 Even if the bodies are a little slower, or “heavier” according to Lemieux, there is no doubt to be had – this game holds all the power in a rivalry where the Avs won two Stanley Cups and the Wings three, between the years of 1996 and 2002. The winner has already called dibs on bragging rights for the rest of time.